Pancreatic serous cystic neoplasms (SCNs) are benign tumors that can be managed conservatively when asymptomatic. They represent approximately 1%–2% of all pancreatic tumors, and histologically, they consist of a monostratified epithelium composed of cuboidal glycogen-rich cells with round nuclei and clarified cytoplasm. The clear cell morphology and the delicate vascular meshwork composed of tiny capillaries beneath the epithelium are the histological hallmarks of these neoplasms. On surgical specimens, numerous macroscopic variants have been described, of which the microcystic type is the most frequently reported form (77%). The imaging appearance of this type is honeycomb microcystic with a central scar that is sometimes calcified. These features are highly suggestive of serous cystic adenoma (SCA) microcystic type, and generally, no further investigations are required to confirm the presumptive diagnosis. However, rarely, the cysts composing the neoplasm are extremely small and crammed each other thus giving the tumor a pseudo-solid aspect on imaging (pseudo solid-appearing serous cystic adenoma, Sa-SCA). Therefore, as well as in less frequent variants such as the SCN macrocystic unilocular/oligocystic type, or the rarely described solid type,,,, there is a differential diagnosis with other cystic or solid neoplasms, requiring different management from that of SCN. Several years ago, a study by Gerke et al. reported a case of Sa-SCA preoperatively diagnosed by EUS-fine-needle biopsy (EUS-FNB) using a Tru-Cut needle (Quick-Core needle, Cook Endoscopy, Winston-Salem, NC). EUS-FNB increases the yield of small tissue fragments, which are useful for ancillary stains that could help make a differential diagnosis among clear cell neoplasias (SCN, NET, RCC).,, Unfortunately, the tru-cut needle was not further employed because of its large bore and difficult maneuverability. To the best of our knowledge, all other reported Sa-SCA cases have resulted in the decision to proceed with surgical resection for the suspicion of a NET or a malignancy, and the definitive diagnosis was always achieved on surgical specimens. Recently, a novel EUS core biopsy fork-tip needle (SharkCore™, Medtronic Corp., Boston, MA, USA) has become available in standard calibers. It is characterized by two penetrating sharp tips of varying lengths separated by four cutting surfaces and has been demonstrated to achieve a high percentage of histological specimens. The aim of this study was to describe the possibility to obtain a preoperative diagnosis of Sa-SCA by using the SharkCore™ needle. Moreover, features of preoperative imaging workup and histopathological/immunohistochemistry findings were highlighted. Patients were identified from a prospectively collected EUS-procedure database and from the electronic pathology archive at the pancreatic care center in Verona, Italy. Data from consecutive adult patients who were referred for EUS-FNB of a solid pancreatic lesion between January 2016 and January 2018 and were histologically diagnosed as having SCN (both preoperatively and/or after resection) were retrieved. To exclude cystic lesions, an expert radiologist and two endosonographers revaluated computed tomography (CT), MRI and EUS images. The study protocol was approved by the Medical Ethics Committee (code 1718CESC). All patients gave informed consent prior to EUS-FNB. EUS procedures were performed with patients under deep sedation, using a conventional linear echoendoscope (EG-3870UTK, Pentax Europe GmbH, Hamburg, Germany). Preliminary EUS evaluation included lesion echogenicity, location, size, loco-regional lymph nodes and vascular pattern after injection of ultrasound contrast media (Sonovue, Bracco, Milan, Italy). A SharkCore™ needle was used with the slow-pull technique and whenever possible, the fanning technique  in all cases. The number of passes was established by the endosonographer according to the macroscopic on-site evaluation of the sample. On-site evaluation was not available in any case. The acquired material underwent standard histologic handling. It was fixed in a 10% formaldehyde solution, embedded in paraffin, sectioned at 3-μm, and then stained with hematoxylin and eosin (H and E). A panel of immunohistochemical markers composed of CK8–18 (1:100, Novocastra, Leica Biosystems, UK), CK 7 (1:100, Novocastra, Leica Biosystems, UK), α-inhibin (1:50, Dako, Denmark), synaptophysin (1:100, Novocastra, Leica Biosystems, UK), chromogranin A (1:2500, Dako, Denmark), GLUT1 (1:100, Thermo Scientific, CA, USA), MUC6 (1:200, Santa Cruz Biotechnology, INC, USA) were used, and histochemical assays with periodic acid-Schiff (PAS) and PAS with diastase digestion (dPAS) were used. After antigen retrieval, immunostaining was performed in an autostainer (Bond Max, Leica Biosystems, UK). Collected data were as follows: (1) demographics (age, gender); (2) clinical symptoms; (3) preprocedural contrast-enhanced cross-sectional imaging (MRI, CT) and nuclear medicine examinations (68Ga-somatostatin receptor positron emission tomography [68Ga-PET] and 18fluoro-deoxyglucose-PET [FDG-PET]) features; (4) EUS features (size, location, and margins) and EUS-FNB procedure data (needle caliber, number of passes); and (5) procedure-related adverse events including intraprocedural retroperitoneal or intraparietal bleeding, clinically relevant bleeding (hematemesis, melena, or drop >2 g/dl of hemoglobin compared with preprocedural value), perforation and acute pancreatitis (abdominal pain associated with an increase of serum pancreatic enzymes over three times the upper limit of normal and/or pancreatitis at imaging); and (6) histological findings and immunohistochemical features. 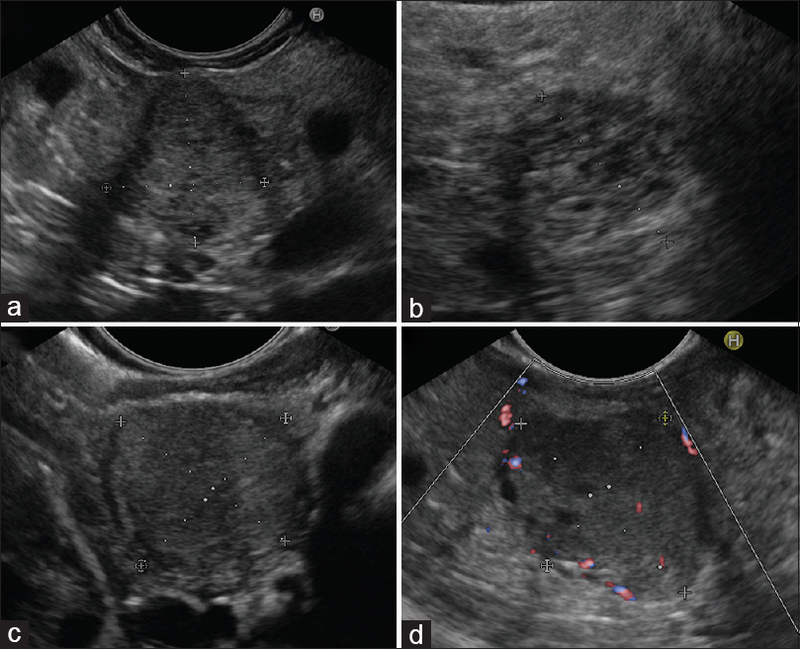 Among nine identified patients, two were excluded because of microcystic appearance at EUS. Therefore, seven patients were evaluated (5 females/2 males, mean age of 62.5 years, the range of 40–73 years) [Table 1]. All lesions were diagnosed preoperatively by EUS-FNB. Pancreatic lesions were all incidentally detected during abdominal CT or MRI performed to investigate not-specific abdominal pain [Figure 1]. Lesions were located in the pancreatic head, neck, and body in 2, 2, and 4 cases, respectively. The mean size was 19.8 mm (range 7–39 mm). A hypervascular pattern was described in all patients, as well as slight hyperintense signal on T2-weighted MRI images. No upstream dilatation of the pancreatic duct was observed. 68Ga-PET and FDG-PET were performed in five patients, revealing no uptake of either tracer. A previous standard EUS-FNA was performed in 3 out of 7 cases, and these smears were bloody and acellular. EUS showed a pure solid appearance and a “crammed laminated” aspect in 5 and 2 cases, respectively [Figure 2]. Margins were smooth in 5 cases and slightly polycyclic/irregular in 2 cases. EUS-FNB was performed using a 22- and a 25-G needle in 5 and in 2 cases, respectively. Three to seven passes (median 4) were performed. All specimens were considered adequate for the diagnosis. In three patients (42.8%), self-limiting retroperitoneal bleeding was detected after EUS-FNB without the necessity for a prolonged hospital stay. No perforation, pancreatitis, or clinically relevant bleeding was observed. The criteria adopted to ascertain the diagnosis of SCA were according to Reid et al. Histologically, core tissue microfragments, composed of tight back-to-back tubules with small, minimal lumina bordered by cuboidal cells with eosinophilic or optical empty, clear cytoplasm and hyperchromatic, round nuclei were detected against a variably bloody background [Figure 3]a and [Figure 3]b. Slender strands of connective tissue were intermingled with the cellular component of the core tissues [Figure 3]c. Occasionally, solid areas of detached cells were visible within clots. The length of the fragments was highly variable from case to case. The diagnostic morphology was adequately evaluable in 5 of the 7 cases, in which biopsy lengths were 600–700 μm. In the 2 remaining cases, the EUS-FNB sample was highly bloody with tissue fragments <550 μm but with preserved areas that were suspicious for SCA [Figure 3]d. Histochemical positivity for PAS and dPAS was observed in all the cases (7/7) [Figure 3]e and [Figure 3]f. Immunohistochemical positivity of the clear cells in the tissue fragments for α-inhibin (7/7 cases), GLUT1 (6/6 cases), and MUC6 (5/5 cases) favored the diagnosis of SCA [Figure 4]a, [Figure 4]b, [Figure 4]c. All cases were negative for the neuroendocrine marker synaptophysin and in 2 cases, for chromogranin A as well [Figure 4]d and [Table 2]. Based on the EUS-FNB results, no patients underwent surgical resection. During a mean follow-up of 20.5 months (range of 12–30), no variation in the pancreatic lesion from MRI or symptom onset were observed. The preoperative diagnosis of SCNs of the pancreas is usually the result of a multidisciplinary discussion of clinical, radiological, echoendoscopic, and cytological data.,,, For pathologists, the diagnosis of SCNs of the pancreas in a presurgical setting is challenging because the cytology suffers from low diagnostic accuracy due to the scant cellularity of the samples,,,,, and no histological material is routinely recruited from these lesions. One of the most important recent advances in the field of EUS-guided tissue acquisition is the development of so-called “forward-acquiring” needles that obtain tissue cores during penetration into the lesion. In particular, two types are currently available: The SharkCore™ and the Acquire™ (Boston Scientific Corp., Marlborough, MA). Both are characterized by a modified tip (fork-tip or Franseen-tip) with several penetrating points and cutting surfaces. While pushing these needles into the lesion, the shearing tip captures the tissue, keeping it intact. Recent studies have demonstrated that is possible to achieve true histological samples in >90% of cases. The current study shows that the preoperative histological diagnosis of SCNs, solid-appearing on imaging, is possible. A presurgical histological diagnosis was obtained in 7 patients underwent EUS-FNB, since we routinely use the SharkCore™ needle. In all cases, the sampling needle retrieved histological fragments. They were composed of small acini with minimal glandular spaces, bordered by polygonal cells with pale or eosinophilic cytoplasm, adjacent to strands of connective tissue [Figure 3]a, [Figure 3]b, [Figure 3]c. The clear cell cytology of the epithelium, that is a histological hallmark of SCNs independently of macroscopic variants (microcystic, macrocystic, solid), was well preserved even in very small tissue fragments [Figure 3]d. In our Sa-SCA series, 3 patients had undergone a previous EUS-FNA that had been attempted with a standard needle and had resulted in inconclusive diagnoses [Table 1]. The reason EUS-FNA usually does not retrieve material useful for the diagnosis can be explained by the histological structure of Sa-SCA. Indeed, lancet needles, while penetrating into the crammed vascularized lesion, rupture the sub-epithelial capillaries resulting in bloody and inadequate specimens. By contrast, we suppose that the forward-acquiring FNB needles, with their several sharp points and multifaceted bevels, accomplish coring of the neoplasm, reducing the rupture of SCA tissue. Therefore, small fragments of well-preserved tumor remain trapped in the needle, thereby enabling the pathologist to identify the SCA histology architecture. SCNs with solid or compact structure with hypervascularity on imaging evoke the suspicious of neoplasia other than SCA and a misdiagnosis could lead to an unnecessary surgery., Our series outlined several preoperative imaging features, raising the index of suspicion of Sa-SCA [Table 1]. These lesions appear hypervascular at imaging, with a hyperdense signal on T2-weighted MRI, without uptake in either 68Ga-or FDG-PET. Nevertheless, even though MRI T2-weighted images of Sa-SCA tend to maintain high intensity longer than do NETs, it is often difficult to distinguish them from other solid pancreatic tumors, including NETs, acinar cell carcinomas, solid pseudopapillary tumors, and metastases from highly vascular carcinomas. For these reasons, histological diagnosis is desirable to decrease the hazards of unnecessary resections. Morphologically, primary clear cell NET and RCC metastatic to the pancreas are the major mimickers of Sa-SCA. Immunohistochemistry is mandatory to generate a differential diagnosis among the malignant and nonmalignant tumors with clear cell features in the pancreas. Neuron-specific enolase, α-inhibin and mucin-related glycoprotein MUC1 and MUC6 positivity have been recognized as unique immunoprofiles for SCNs to differentiate it from other pancreatic tumors., Furthermore, markers of clear cell tumorigenesis (GLUT-1, HIF1-α, and CAIX), and calponin  have been detected in SCNs, as well. In the EUS-FNB series of the current study, the diagnosis of SCA was supported by immunohistochemistry with a staining profile consistent with the profile described in the literature [Table 2]. The material retrieved by the sampling needle was, in terms of quality and quantity [Figure 3], adequate to apply a wide panel of antibodies capable of assessing the serous nature of the lesions and to exclude the suspicion of other clear cell neoplasias [Figure 4]. SCNs are not recognized by a specific antibody, but by a distinctive immunohistochemical signature.,, To increase accuracy, several antibodies need to be used. More available neoplastic material increases the morphological and immunohistochemical diagnostic accuracy. Standard EUS-FNA recruits very few cells from SCNs, and cytological diagnosis is challenging. To improve sample cellularity, the cell-block has been proposed by some authors, with variable results.,, However, in cell-blocks with abundant cellularity, the presence of contaminating gastrointestinal epithelium or neuroendocrine cells derived by benign islets could result in misinterpretation. By contrast, in EUS-FNB tissue, the correlation between the morphology and the topographic distribution of antibody staining reduces the risk of misdiagnosis. All the Sa-SCAs of our series showed precise immunohistochemical staining thanks to the well-preserved morphology of the material [Figure 4]. No artifacts secondary to crushing effects of the sampling needle were observed. The high rates of intraprocedural bleeding reported in this study deserve to be discussed. In three (42.8%) patients, we observed the onset of retroperitoneal hematoma. The combination of end-cutting tip needles and hypervascular lesions can explain such high percentage. However, all cases were self-limiting and relatively trivial. No patients developed symptoms or required prolonged hospitalization or medical intervention. Therefore, according to the American Society for Gastrointestinal Endoscopy criteria, they are not significant enough clinically to be called “adverse events.” However, some few procedural adjustments could be useful to prevent sequelae. According to our experience, we could suggest to reduce the number of back and forth movements during the sampling, thus reducing intralesion trauma. Whenever possible, in between the biopsy passes, it could be useful to apply a gently pressure with the ultrasound transducer over the needle entrance to reduce the needle tract bleeding. This study has several limitations. First, the number of patients was limited; nevertheless, the rarity of Sa-SCA makes it difficult to gather a larger population. Second, none of our patients underwent surgical resection to confirm the diagnosis; however, preoperative diagnosis aims to avoid unnecessary surgery. Third, we cannot draw any conclusion regarding EUS-FNB diagnostic accuracy in this setting of patients. Fourth, selection bias of cases might exist since only Sa-SCAs were included. Solid appearance could reflect dense cellularity that might facilitate to obtain sufficient specimen; this condition could not be present in others SCA variants. Finally, we have not a structured control group to compare with standard cytology, even if three of our patients had a previous EUS-FNA. Moreover, published literature is clear in decreeing the failure of cytology in this setting of patients. Sa-SCA is a rare entity that is often misdiagnosed and treated with unnecessary surgical resection. Typical preoperative workup shows a hypervascular lesion with a slightly hyperintense signal on T2-weighted MRI, without uptake on nuclear medicine examinations. The use of a forward-acquiring needle can help achieve definitive histological diagnosis. The well-preserved histology of the needle biopsy guarantees the quality standards for immunohistochemical staining. Reid MD, Choi HJ, Memis B, et al. Serous neoplasms of the pancreas: A clinicopathologic analysis of 193 cases and literature review with new insights on macrocystic and solid variants and critical reappraisal of so-called “Serous cystadenocarcinoma”. Am J Surg Pathol 2015;39:1597-610. Barresi L, Crinò SF, Fabbri C, et al. Endoscopic ultrasound-through-the-needle biopsy in pancreatic cystic lesions: A multicenter study. Dig Endosc 2018;30:760-70. Jais B, Rebours V, Malleo G, et al. Serous cystic neoplasm of the pancreas: A multinational study of 2622 patients under the auspices of the international association of pancreatology and European Pancreatic Club (European Study Group on Cystic Tumors of the Pancreas). Gut 2016;65:305-12. Takeshita K, Kutomi K, Takada K, et al. Unusual imaging appearances of pancreatic serous cystadenoma: Correlation with surgery and pathologic analysis. Abdom Imaging 2005;30:610-5. Gabata T, Terayama N, Yamashiro M, et al. Solid serous cystadenoma of the pancreas: MR imaging with pathologic correlation. Abdom Imaging 2005;30:605-9. Okumura Y, Noda T, Eguchi H, et al. Middle segment pancreatectomy for a solid serous cystadenoma diagnosed by MRCP and review of the literature: A case report. Mol Clin Oncol 2018;8:675-82. Sanaka MR, Kowalski TE, Brotz C, et al. Solid serous adenoma of the pancreas: A rare form of serous cystadenoma. Dig Dis Sci 2007;52:3154-6. Geramizadeh B, Dabbaghmanesh MH, Nikeghbalian S, et al. Solid serous adenoma of pancreas, misdiagnosed as neuroendocrine tumor, a rare case report and review of the literature. J Gastrointest Cancer 2016;47:462-5. Collins BT. Serous cystadenoma of the pancreas with endoscopic ultrasound fine needle aspiration biopsy and surgical correlation. Acta Cytol 2013;57:241-51. Gerke H, Silva R, Jensen CS. Hypervascular pancreatic tumor diagnosed as a serous cystadenoma by EUS-guided trucut biopsy. Gastrointest Endosc 2006;64:273-4. Kosmahl M, Wagner J, Peters K, et al. 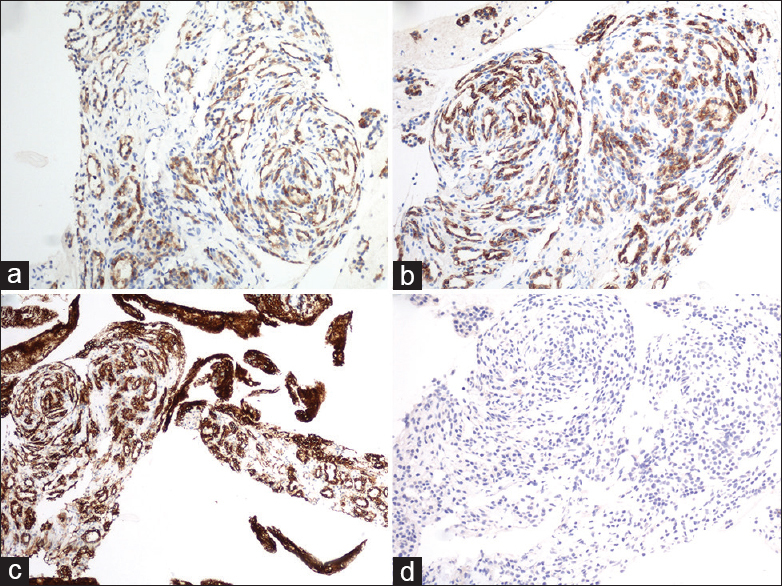 Serous cystic neoplasms of the pancreas: An immunohistochemical analysis revealing alpha-inhibin, neuron-specific enolase, and MUC6 as new markers. Am J Surg Pathol 2004;28:339-46. Reid MD, Choi H, Balci S, et al. 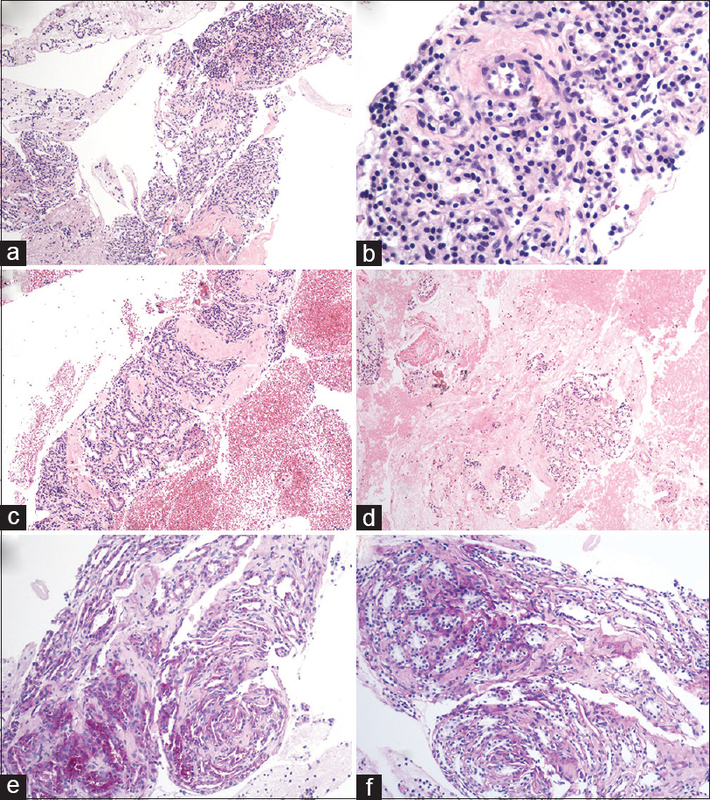 Serous cystic neoplasms of the pancreas: Clinicopathologic and molecular characteristics. Semin Diagn Pathol 2014;31:475-83. Salomao M, Remotti H, Allendorf JD, et al. Fine-needle aspirations of pancreatic serous cystadenomas: Improving diagnostic yield with cell blocks and α-inhibin immunohistochemistry. Cancer Cytopathol 2014;122:33-9. Bang JY, Hebert-Magee S, Navaneethan U, et al. Randomized trial comparing the franseen and fork-tip needles for EUS-guided fine-needle biopsy sampling of solid pancreatic mass lesions. Gastrointest Endosc 2018;87:1432-8. Crinò SF, Conti Bellocchi MC, Bernardoni L, et al. Diagnostic yield of EUS-FNA of small (≤15 mm) solid pancreatic lesions using a 25-gauge needle. Hepatobiliary Pancreat Dis Int 2018;17:70-4. Machado MC, Machado MA. Solid serous adenoma of the pancreas: An uncommon but important entity. Eur J Surg Oncol 2008;34:730-3. Huang P, Staerkel G, Sneige N, et al. Fine-needle aspiration of pancreatic serous cystadenoma: Cytologic features and diagnostic pitfalls. Cancer 2006;108:239-49. Belsley NA, Pitman MB, Lauwers GY, et al. 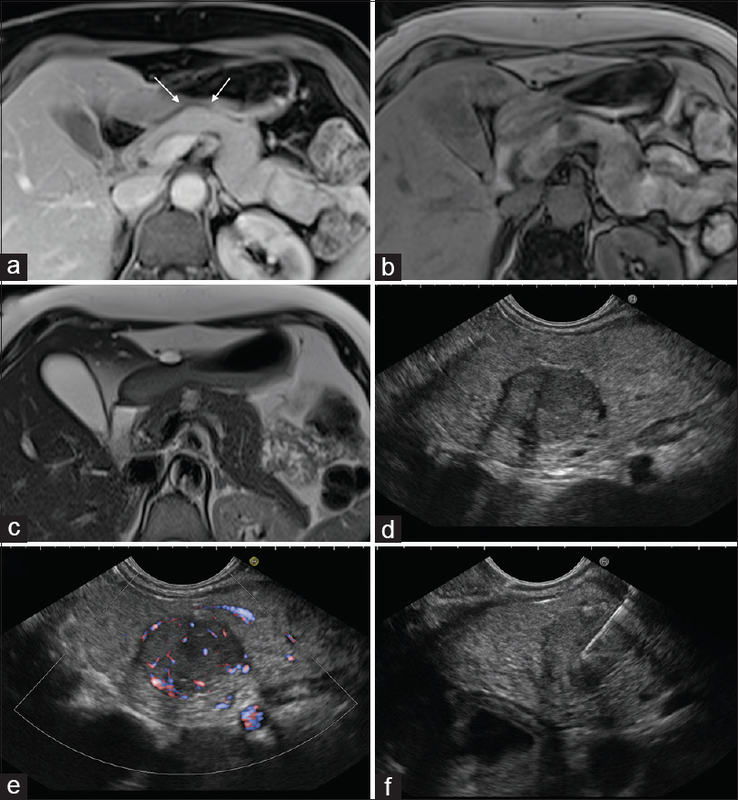 Serous cystadenoma of the pancreas: Limitations and pitfalls of endoscopic ultrasound-guided fine-needle aspiration biopsy. Cancer 2008;114:102-10. Perez-Ordonez B, Naseem A, Lieberman PH, et al. Solid serous adenoma of the pancreas. The solid variant of serous cystadenoma? Am J Surg Pathol 1996;20:1401-5. Basturk O, Singh R, Kaygusuz E, et al. GLUT-1 expression in pancreatic neoplasia: Implications in pathogenesis, diagnosis, and prognosis. Pancreas 2011;40:187-92. Thirabanjasak D, Basturk O, Altinel D, et al. Is serous cystadenoma of the pancreas a model of clear-cell-associated angiogenesis and tumorigenesis? Pancreatology 2009;9:182-8. Marsh WL, Colonna J, Yearsley M, et al. Calponin is expressed in serous cystadenomas of the pancreas but not in adenocarcinomas or endocrine tumors. Appl Immunohistochem Mol Morphol 2009;17:216-9. Pitman MB, Lewandrowski K, Shen J, et al. Pancreatic cysts: Preoperative diagnosis and clinical management. Cancer Cytopathol 2010;118:1-3. Ieni A, Todaro P, Crino SF, et al. Endoscopic ultrasound-guided fine-needle aspiration cytology in pancreaticobiliary carcinomas: Diagnostic efficacy of cell-block immunocytochemistry. Hepatobiliary Pancreat Dis Int 2015;14:305-12. Crinò SF, Bernardoni L, Manfrin E, et al. Endoscopic ultrasound features of pancreatic schwannoma. Endosc Ultrasound 2016;5:396-8.